The simplest cultivation vessel is a flask containing the microalgal suspension placed on a shaker with illumina tion. In this way, stock cultures of microalgae are usually maintained. Glass cylinders or flat flasks kept in a tem perature controlled water bath and bubbled with a mixture of air with CO2 are commonly used to cultivate microalgae and cyanobacteria in small volumes up to 1 l (Figure 1). The outdoor culture is scaled up in stepwise fashion, starting with the laboratory culture in an approximately 1:5 dilution ratio. It is advisable not to expose diluted laboratory cultures outdoors to full sunlight during the first few days, in order to avoid the risk of photooxida tion. 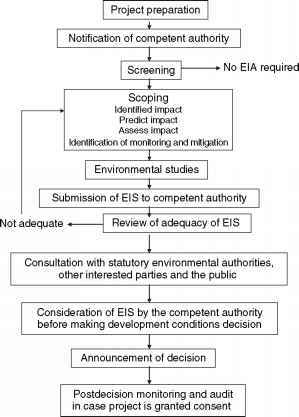 However, a minimum biomass concentration corresponding to about 10 mg chlorophyll per liter is recommended. Figure 1 Laboratory cultivation using glass cylinders (i.d. 30 mm, volume 0.31) placed in a temperature-controlled waterbath with backside illumination from fluorescent lamps (Institute of Microbiology, Academy of Sciences, Trebon, Czech Republic). 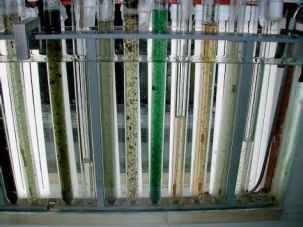 Mixing of the microalgal suspension is maintained by bubbling through a mixture of air + 2% CO2.